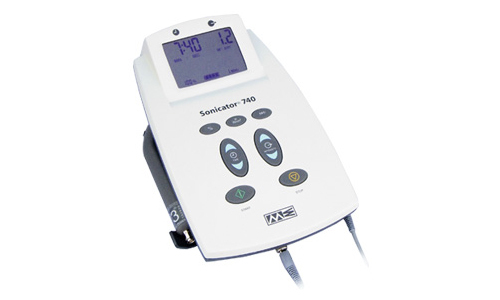 The Sonicator 740 is 1 and 3 MHz therapeutic ultrasound unit that comes standard with a 5cm2 dual frequency applicator. It is light-weight and portable and features a universal applicator cable to make changing applicators quick and easy. There is an optional rechargeable lithium ion battery pack that truly allows you to take therapy on the road with you. Large soft-touch controls let you set-up treatments quickly and easily and the backlit display shows all treatment parameters and conditions. The Sonicator 740 offers two patented technologies. Direct Crystal-to-Patient contact and our Universal Applicator Cable. The Sonicator 740 ultrasound applicator features unique crystal-to-patient technology that delivers ultrasound directly to the patient without a metal interface as well as watertight characteristics for underwater therapy. Unique Universal applicator cable is the only truly detachable cable on the market. It detaches from both ends of the cable allowing the clinician to change applicators quick and easily. Both of these patented features cut down on service time as well extending the overall life span of the device.